Weldon senior Will Hoggatt will continue to work on the project he started in a Senior Design Projects Course while pursuing a graduate degree. He hopes to one day start a business with the finished product. Thanks in part to an NIH-funded grant to establish a multidisciplinary, team-based, clinical needs-driven approach to translational engineering design, the Weldon School senior design paradigm now closely resembles real-world situations. Weldon School seniors experience the design process from need identification and idea generation through the iterative process to ultimately resolution of a real problem in healthcare delivery. In an ideal scenario, the senior design experience for undergraduates would be one which closely resembles the real world, a world in which people of diverse backgrounds and expertise join forces to design solutions that address challenging real-world biomedical problems at the interface of engineering and living systems. In the real world, such an experience fosters pioneering discoveries that are as rewarding to the engineer as they are to the patients who ultimately benefit from the discoveries after they move into the clinical setting. Now, at the Weldon School, seniors can have that experience. Sherry Voytik-Harbin, an associate professor of biomedical engineering, and one of the co-PIs on the five-year project, spoke about how the course sets up undergraduate students to fully appreciate the biodesign process and to reap the rewards. “And if in the process we get students hooked on translational research, all the better,” Voytik-Harbin added. “Sometimes the experience can be life-changing.” Sometimes students find themselves in senior design, and that changes the trajectory of their career. It was about this time that Hoggatt’s life began to change course. During the senior design semester, Hoggatt was interviewing for a job in industry. But, Voytik-Harbin saw his passion and talent for translational research and design and encouraged him to stay at Purdue and pursue a graduate degree. It didn’t take long for Hoggatt to change his plans. The success he had in senior design coupled with the positive encouragement from faculty mentors clinched his decision to enter the Weldon graduate program after graduation. “I looked at it as an opportunity to apply what I learned and actually make something that could one day be useful,” Hoggatt said as he reflected on the experience. 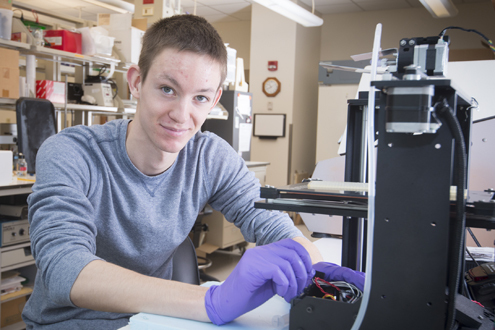 “That was why I wanted to become an engineer in the first place.” Hoggatt plans to continue working on the 3D bioprinter project in grad school and perhaps one day start a business with the finished product.